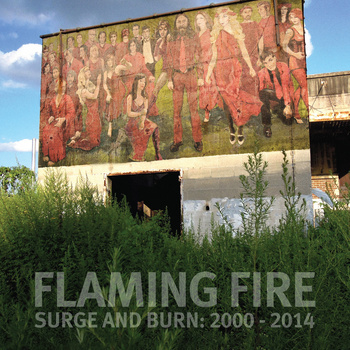 Brooklyn, New York based Flaming Fire are back with a career spanning compilation of their work recorded between 2000-2014. Headed up by Patrick Hambrecht, the band have included over 30 members and created a wild variety of music. To say these guys are off the beaten path is an understatement. When I reviewed their Get Old And Die With Flaming Fire album in 2001 I made references to The Residents, Frank Pahl/Only A Mother, and Devo. When Chuck reviewed their When the High Bell Rings album in 2007 he made references to Gong and Amon Düül II. Side 1 consists of what I’ll call Flaming Fire’s Lo-Fi period. Though recorded in the early 2000s, these songs sound like the more creative end of the 1980s homemade music/cassette culture heyday. We’ve got lo-fi whacky songs with a Residents vibe, well-crafted pop ditties, freaky spaced out tape collage fun, and avant-Prog á la Art Bears. My favorites are Disco of Souls, which sounds like Weird Al Yankovic fronting a Dada-ist Dub-Disco off-Broadway show, and In The Summertime When Everything is Holy which features sunshine Psych-Pop with bubbling spacey noise and cool oddball guitar. Flaming Fire up the ante on Side 2. The first two songs are my favorites. The Stars That Burn opens and I love the combination of howling and bubbling soundscapes, simplistic electro beats and melodies, and sophisticated multi-part vocals, giving the thing an Industrial show tune quality, before launching into a smokin’ rock ‘n roll finale. If not for the humorously demented lyrics, Lemon Isis could have been a hit single in the 80s. I shudder at the MTV video these guys would have made if given a budget. The vocals and harmonies are damn good. Stephen and Gun Through A Razor both feature high intensity orchestrated Prog for the off-Broadway avant-garde, the latter including a fist pumping Metal infusion. I like the creatively quirky vocal mind-fuckery of There Is A Sky and the zany electro tribal Avant-Pop of Your Love Belongs To Me. These guys really do amazing things with multi-part vocals. Side 3 features Flaming Fire at their theatrical avant-garde punked out rock ‘n roll Cabaret best. We’ve got swinging rock ‘n roll that is deranged in all the best ways, theatrical Space-Punk-Pop, and Cabaret Metal. My favorites are The Way You Kill Me (Blood Does Shine), with its electro alien rave-Punk and dance-Metal, and High Bell which features nutty show tune Space-Punk with a dream-Pop interlude. Side 4 is the latest Flaming Fire album, Shriek Of Heaven. Car Crash is like a Flaming Fire twisted take on The Bangles, and is another one that could have been a hit in the 80s. This is a damn good song. Esao consists of killer Slits meets The Runaways Punk that goes into deep space. I love the gnarly Inspirational and bouncy Folk-Pop of Holy Holy Holy. Motor Running shows what happens when Flaming Fire get angy. The heavy driving powerhouse rocking Star Snuff might be the most intensely gripping song of the set, with its manic Nina Hagen styled vocals and spaced out guitar. Definitely my Side 4 favorite. And Surge And Burn ends the set with high energy Rock and majestic Psychedelia. In summary, this is a seriously fun compilation from a band that’s bursting with energy and a flair for creatively channeling and morphing all their freaky alien Punk and Cabaret art-Rock aspirations. Looking at the live performance pics in the LP gatefold jacket sent me running to YouTube to see what these nutters are like live. CLICK HERE for a list of videos that I guarantee are worth your time. The download (the LP includes a download code) comes with a 138 page Flaming Fire zine that’s jam packed with info, pics, lyrics, memories from band members, comix, and more.